I use rsnapshot, on Centos 7, to manage the vast majority of my backups across a myriad of linux servers both within my network and across the globe. I’ve never blogged about the entirety of that process, but I wanted to post a quick note about how I use rsnapshot to also backup the configuration of my router. Until recently, I had been using this process to backup my pfSense routers. With my switch to OPNsense though, I was pleased to see the process is the same. Basically, we just need to make a copy of a single folder on the machine, ‘/conf’, which is located right off of the root on both pfSense an OpnSense. As often happens with computers of all types, log files build up over time. Generally speaking, the operating system will rotate these logs, which means it breaks them up into chunks, but it isn’t usually set to remove the old chunks. Over time, those log files can start to add up. I am giving some thought to changing the provider of the VPS that hosts this web page, since performance is not consistent and the VPS is not very reliable, and I was curious to know how much disk space I needed for the system to run well. After doing some light clean up on the system I did a check to see where on the disk I was using the most space. I’ve been using Raspberry Pi computers for several years. A few months ago the Raspberry Pi B I had hooked up to my TV and running OpenElec, stopped working. The Pi was locked up and then wouldn’t reboot when I pulled the power cord. It’s an original B model, with just two USB ports, so I didn’t think much of it. I prepped and put in place a replacement Pi, also running OpenElec, and threw the Pi into a drawer for further inspection..later. I got 4 years faithful service from a $35 computer so I wasn’t complaining. Some weeks later, I had an idea that I wanted to use a Raspberry Pi for so I grabbed the questionable unit and got to work. Maybe I’m alone here, but I still have occasion to install Windows 7 from time to time. For a while, that was no big deal; Install the OS, update, update, update and you’re good to go. Lately though, the process has become far more cumbersome. Not only does the process take ages to complete, but when you’re done its always nagging you to update to Windows 10. What follows is my process for getting this done without too much hassle. Firstly, I’ve not created anything new here. I’ve simply found a series of tools and bit of information online that helped me along the way so I’m compiling it here for my future benefit. I have a Thecus N5200 that was modified to have a VGA port. Though the machine will run a variety of current Linux distributions, I wanted it to run Centos 6. Unfortunately, the N5200 doesn’t support PAE, which Centos 6 requires. Back in 2007, I bought a Thecus N5200 to use as bulk storage on my network. I’ve spent many years using and fighting with the unit but it wasn’t until my storage needs out grew the 5 SATA disks it could hold that I considering sending it off to be recycled. Having read countless accounts online from people who have taken various lapdocks and paired them with a Raspberry Pi, I thought I would give it a try myself. I went to Ebay and purchased a Motorola Lapdock 100. It’s a small unit with a cable that comes out that back. This cable has a header with a Micro-USB and Micro-HDMI connector on it. General wisdom seems to be buying series of adapters and cables and then sort of whittling them down until they fit. I dutifully bought the necessary bits but when the Lapdock arrived it seemed much easier to just take apart that cable header instead. What I discovered is that inside that header is simply the two cables held in place with some soft plastic. 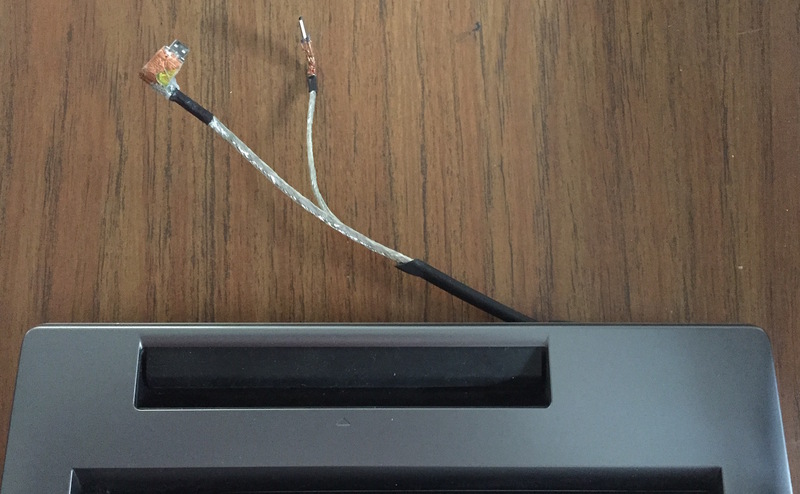 Having removed the plastic and cutting back the cable, I have two loose cables that I can use freely. I’m a bit of an aviation buff and have been known to spend a fair few hours playing flight sims. My favorite sim these days is X-Plane, and thankfully it runs on Windows, Mac and Linux. My current host for X-Plane is Fedora 20 and since there is a bit of extra effort to make it run properly, I thought I’d outline my process here. When life hands you lemons though, one needs to try to make lemonade. Since I needed to replace hardware I wanted to make sure I put in place some hardware I could trust to last another 5 years and hardware that would sip power… not guzzle it down like the now dead antique desktop tower computer had. My needs are pretty low performance-wise and I don’t need to have a super high performance setup. I just need a powerful feature set.